The year is 1935, and one of John Welles’ best friends, Sam Feldman, has just been swept off his feet by the beautiful and charming Abigail Cohen. Gladys Feldman, Sam’s mother, orchestrated the initial meeting between her son and Abigail, called Babby. Gladys’ goal was to curtail her late-blooming son’s wild dating spree and settle him down with a good Jewish girl. Her planned work, and before the end of their first visit, Sam and Babby were in love. Fast forward a few months to Sam’s bachelor party. John, along with his other best friend, Claude Willoughby, takes Sam on a three day bachelor’s weekend prior to his marriage to Babby. The trio sneaks off to Kentucky to watch the Derby and revel in the festivities. The only hitch to their plans is a small white lie told to keep the women in their lives from worrying; they claim they’re going to a pediatric conference. Being the savvy women they are, Mrs. Feldman, Babby, and John’s Aunt Prudence laugh over their boys believing they’ve gotten away with their scheme. The Kentucky Derby is rich with too much history for one blog post. For this reason, I decided to start with the horse who won the Derby in 1935, Omaha. The chestnut horse with a white blaze stood at an impressive 16.3 hands high. The third horse to ever win the Triple Crown, Omaha was the son of Gallant Fox, the 1930 Triple Crown winner. I have included footage of Omaha being ridden to victory at the Kentucky Derby by jockey, Willie Saunders, as well as a clip of all three of his Triple Crown wins. In January of 1936, Omaha made the move to England to continue his racing career with the Ascot Gold Cup the desired goal. While he ran well in several races, he never achieved the coveted trophy. During retirement, Omaha failed to impress as a stud horse. He was moved a couple of times before landing in Nebraska where he lived for another nine years. 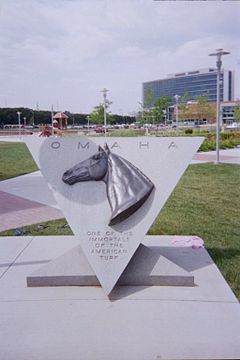 Upon his death in 1959, Omaha was buried at the Ak-Sar-Ben Racetrack in Omaha, Nebraska. I enjoyed reading this posting. Went to the link and watched Omaha win the Triple Crown. I am scared of horses but I do enjoy watching them. They are a beautiful powerful creation of GOD.